Offering maximum protection in all weathers, the new Armatek 60 brolly from Sonik resets the benchmark from which all other brolly systems can now be judged. Manufactured from 20,000 HH Armatek material capable of keeping you warm and dry in the worst weather. The space saver hub mechanism plus wide-span frame design provides excellent space for bed placement whilst leaving ample room for other equipment to be easily stored within the brolly. The revolutionary new tri-pole bar system that makes it a breeze to set up and eliminates the need for clumsy storm poles, with the whole brolly system remaining solid and rigid in all weathers. On the inside and attached to the tri-pole on each side are two mesh storage pocket systems, so convenient for keep valuables and other small items safe and dry. Internal vapour skin is also supplier as standard and eliminates condensation whilst also housing a third storage pocket at the top. The vapour skin can be unzipped at the back to reveal a large oval ventilation panel, which can be opened and closed from both the inside and outside. The full zip on/zip off front panel has two mozzi-mesh front panels and can be easily converted to a panoramic letterbox view. The two-way removable letterbox door has universal clear, mozzi-mesh and green panels for ultimate customisation and adaptability for all circumstances and individual requirements. 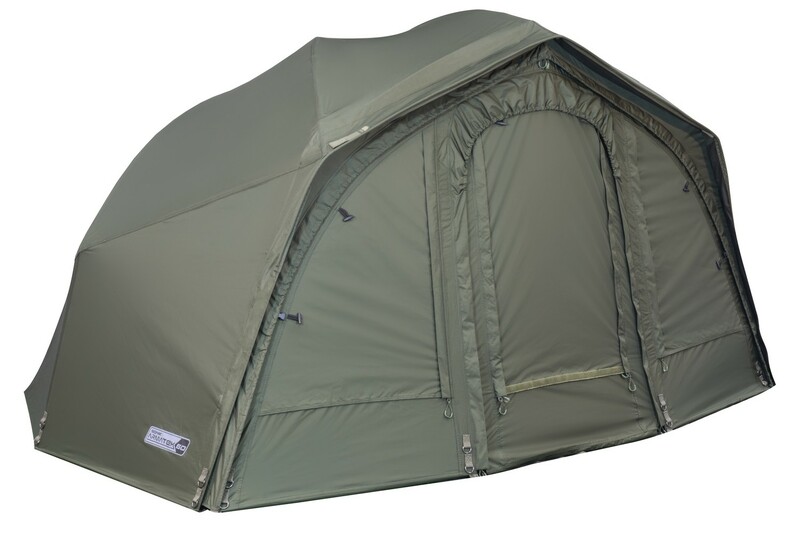 The heavy-duty groundsheet is easily clipped in, whilst the front rain drip guard will keep the rain out keeping you snug and dry, whilst the two rod retainer straps and multiple height setting allow you to customise your set up to suit.